Geneva – IOM, the UN Migration Agency, reports that 22,439 migrants and refugees entered Europe by sea through the first 122 days of 2018, with about 42 per cent arriving in Italy and the remainder divided between Greece (38%) and Spain (20%). This compares with 45,540 arrivals across the region through the same period last year and 184,793 at this time in 2016. In other words: Mediterranean arrivals at this point in 2018 are running at well under half last year’s level on this date, and about 12 per cent of 2016 arrivals at this point in the year. IOM Rome’s Flavio Di Giacomo reported that 9,467 migrants and refugees reported arrived in Italy in 2018 represent nearly a 75 per cent decline from the 37,250 that arrived at this point in 2017. IOM Libya’s Christine Petré reported that for the month of April, Libyan Coast Guard units rescued or intercepted 1,485 migrant men, women and children during the month, bringing to 4,964 the total number of irregular migrants returned to Libya after debarking from Libya (see chart below). She added Libyan authorities recorded the discovery of 11 victims of drowning or other accidents during the month. Those deaths are among the 615 IOM’s Missing Migrants Project has recorded across the Mediterranean in 2018. Most recently, nine migrants lost their lives when trying to cross from Libya to Italy. On 30 April, the remains of two men were found in Garaboli, Libya, while the body of a woman was retrieved in Tajoura, east of Tripoli. Six more bodies – those of five adult men and one baby – were recovered in Zuwara. In the Western Mediterranean, the remains of a man were recovered from a beach in Aïn El Turck, Algeria on 2 May. He is believed to have died in a shipwreck that took place last Sunday (29 April) off the coast of Cap Falcon. The current death toll from Sunday’s shipwreck stands at 16 dead and 3 missing, with 19 survivors rescued by Algerian civil protection authorities. In Spanish waters, so far, this year, IOM Madrid’s Ana Dodevska reports 4,409 men, women and children have been rescued trying to enter Europe by sea through 2 May 2018. That compares with 4,161 through all of May last year (see charts below). MMP reports that 217 sea fatalities have been reported this year on the Western Mediterranean route, compared with 224 fatalities recorded on this same route through 12 months of 2017. IOM Greece’s Kelly Namia reported Monday that over the three days (29 April-1 May) the Hellenic Coast Guard reported at least two incidents requiring search and rescue operations off the island of Lesvos and Chios. The Coast Guard rescued 71 migrants off the islands of Lesvos and Megisti. Namia reported that along with other landings on Lesvos and Chios – as well as the islands of Kos, Megisti and Samos – another 378 migrants landed in the Aegean these three days, bringing to 8,516 the total number of irregular migrants entering Greece via sea since 1 January – for an average of just over 70 persons per day (see chart below). April saw 3,083 migrant arrivals via the Eastern Mediterranean. Ms. Namia also prepared for this report a list of the five busiest migration days her mission has reported in the Aegean since 2014. All five fell during the months of September and October 2015—so almost three years ago, during the peak of the Eastern Mediterranean emergency—when on five separate occasions at least 8,000 migrants and refugees arrived on Aegean islands after leaving Turkey. On two of those dates, over 9,000 arrived. 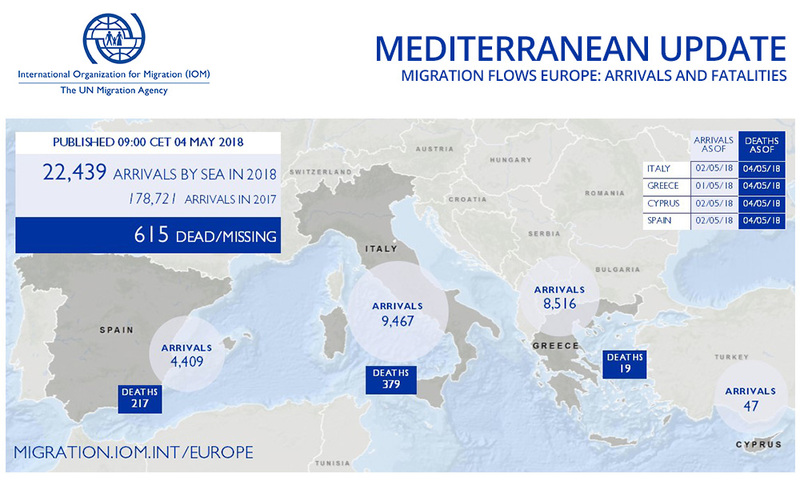 IOM believes these comparisons are important to keep in mind, especially given that our unit reported this week that for all of the month of April 2018 there were barely 7,000 arrivals across all of the Mediterranean, a number that was routinely surpassed daily during several months in 2015. Worldwide, IOM’s Missing Migrants Project has recorded 1,067 people who died or went missing while migrating in 2018, including on the Mediterranean (see chart below). Elsewhere since IOM’s last report: on the Texas-Mexico border, a young man of unconfirmed nationality died trying to cross the Rio Bravo/Rio Grande in an effort to reach the US on 29 April. It was the 22nd death by drowning on this border recorded in 2018. In Mexico, the body of a 30-year-old Salvadoran migrant was found near train tracks in Toluca, Estado de México on 2 May. In Europe, an unidentified Algerian man drowned in the Kolpa River on the border between Slovenia and Croatia on 30 April. He was survived by seven other fellow migrants. Additionally, the MMP team recorded the deaths of 47 people who fled their homes in the Democratic Republic of the Congo after a violent attack and drowned while trying to cross the Ubangi River seeking refuge in the Congo. IOM estimates 47 would the minimum loss of life in this tragic accident, which occurred on 25 April.